There are 18 Memory Care Facilities in the Coral Springs area, with 1 in Coral Springs and 17 nearby. The average cost of memory care in Coral Springs is $3,000 per month. This is lower than the national median of $4,650. Cheaper nearby regions include Hollywood with an average starting cost of $2,933. To help you with your search, browse the 39 reviews below for memory care facilities in Coral Springs. Better rated regions include Margate with an average rating of 4.6 out of 5 stars. Caring.com has helped thousands of families find high-quality senior care. To speak with one of our Family Advisors about memory care options and costs in Coral Springs, call (855) 863-8283. Promotion ends in 104 days! Located between the Atlantic coast and the Everglades, Coral Springs, Florida, has an estimated population of 133,000, including some 13,300 residents over 65. With more than 39,000 probable Alzheimer's disease cases in Broward County, there's growing demand for memory care services in Coral Springs. Dementia patients and their loved ones can choose from more than a dozen memory care facilities in the area. Assisted living communities that serve residents with dementia or cognitive impairments typically have an extended congregate care (ECC) endorsement or another specialty license. 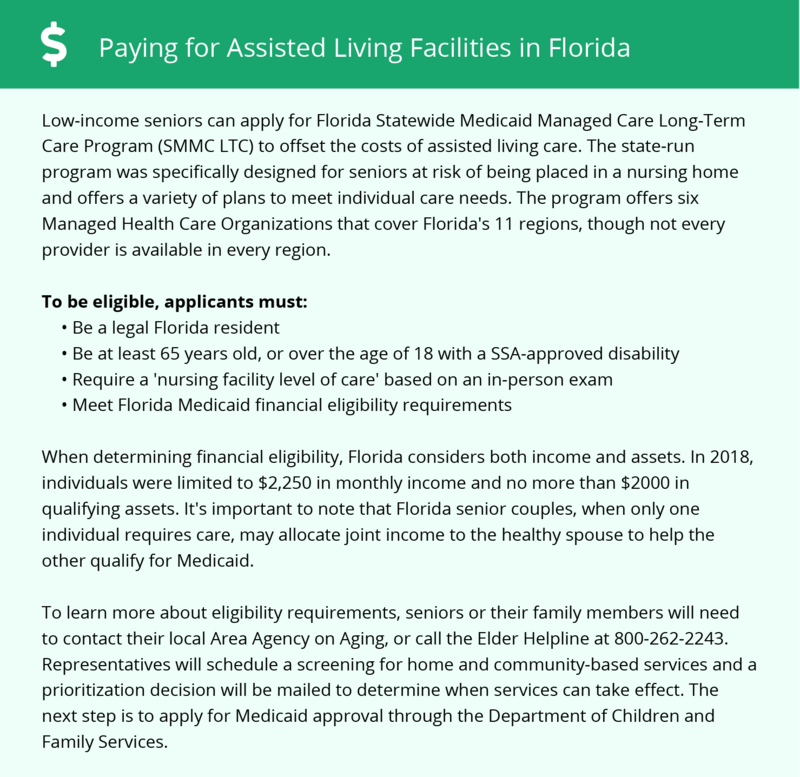 The Florida Agency for Health Care Administration's Assisted Living Unit inspects and licenses all such facilities. Coral Springs' fine weather and mild climate is one reason why the area is so popular among seniors. The community has received an outstanding comfort score of 88 out of 100. Despite the pleasant weather, it's wise for relatives to look for memory care facilities that have adequate climate controls and backup power sources to protect residents from the summer heat and humidity. Florida is one of the nation's 10 most tax-friendly states for retirees according to Kiplinger. It does not have state-level income tax, so residents can keep more of their retirement benefits from Social Security, 401(k) accounts and IRAs to use for health care and other essentials. On average, the combined state and local sales tax is around 6.8 percent, which also benefits those who live on a fixed income. Due to its mild climate and desirable location, the cost of living in Coral Springs is approximately 38 percent higher than the national average. Slightly lower utility rates and health care expenditures are advantageous for local seniors. However, housing and transportation costs are moderately higher than other cities in Florida and the rest of the U.S.
Coral Springs is home to world-class medical facilities, including those specializing in brain health and dementia care, such as Boca Raton's Comprehensive Center for Brain Health at Florida Atlantic University, in the event of medical emergencies or illnesses. Memory Care costs in Coral Springs start around $3,000 per month on average, while the nationwide average cost of memory care is $4,798 per month. It’s important to note that memory care rates in Coral Springs and the surrounding suburbs can vary widely based on factors such as location, the level of care needed, apartment size and the types of amenities offered at each community. Coral Springs and the surrounding area are home to numerous government agencies and non-profit organizations offering help for seniors searching for or currently residing in an assisted living community. These organizations can also provide assistance in a number of other eldercare services such as geriatric care management, elder law advice, estate planning, finding home care and health and wellness programs. To see a list of free memory care resources in Coral Springs, please visit our Assisted Living in Florida page. Coral Springs-area assisted living communities must adhere to the comprehensive set of state laws and regulations that all assisted living communities in Florida are required to follow. Visit our Memory Care in Florida page for more information about these laws.